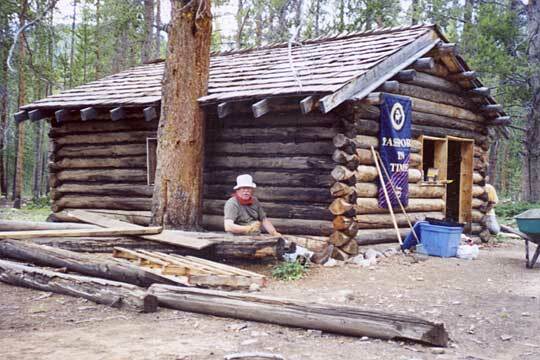 Luckily for the PIT volunteers in Teller City, Colorado, in July 2001, this couple who showed up on the eve of our project was not a part of our group. But their assertions made for lively conversations around our first campfire that evening. And I have to confess that later in the night, the rustles of pine trees and the wooing of the wind through the thin walls of my tent sparked my imagination. Our task during the week-long project was to install interpretive signs on a half-mile path through Teller City, a once-bustling, late-1870s silver-mining town. 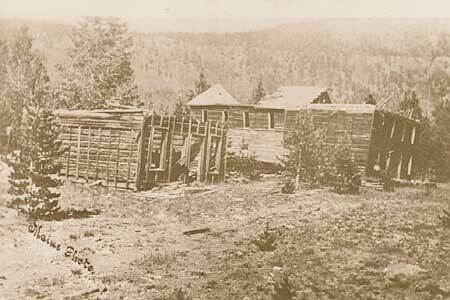 Additionally, we were to secure chinks of wood between the logs in the interior of a reconstructed cabin. Following that, we would daub mud on the outside, thus making the cabin weatherproof. (Roof shingling had been completed two summers ago.) Path restoration and the installation of a large signboard adjacent to the parking lot would complete our chores. There’s a good feeling about working toward the completion of a worthwhile project, knowing some of the history of the place, and preparing it so that visitors can understand something of the lives of the 1,200 or so folks who lived in Teller City during its heyday. Working with other volunteers, listening to their backgrounds, and understanding their motives for volunteering made the experience most enjoyable. The continuing camaraderie at the evening campfires solidified our friendships, which will continue past the end of the project. FS personnel are eager to share their knowledge, and most PIT projects include time to explore the area. One evening, just before dusk, we went to a prime moose-viewing spot along the Illinois River. We listened, peered through binoculars, and there was nary a moose. No matter. The setting was peaceful. Our vista included snow on the surrounding mountains, grassy leas, and the quiet that can come only with silent observers of nature. We finished our chores just after noon on Friday, all of us sensing that we had done something important in opening the past to the current generation. But we saw no ghosts all week.